A fabric treated by fulling. Fulling - felting is a technology process when the wool fabric reach their characteristic thick appearance, full to feel as well as certain stabilization. For fulling the shear structure of a wool fibre is important. Wools that have more flakes, for example Merino, are fulled well, wools with small number of flakes or with badly developed flakes are fulled poorly. Generally, fine and crimped wools are fulled better than coarse wools. 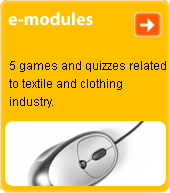 Level of felting is also dependent on the type of yarn and fabric. Well twisted yarns show less felting power than the yarns with less twists. Fabrics with looser weave are fulled better. The process is positively impacted by humidity, warmth and pressure. With raising temperature the effect of fulling raises as well. Raising and felting is also accelerated by using additive, soaps, alkalis, acids as well as fulling preparations.